My most challenging aspect in making is trying new ideas and experimenting with different designs and techniques. I know that probably sounds odd because like many of you know, if you’ve ever tried to be “creative” that’s essentially all you do. Tinker around, play with shapes, play with colors until you land on something that seems right or seems like it fits. Ceramics is an odd and quirky form of creative expression. An entirely different beast. Often times, most experimentation leads to catastrophe. Once things are created in ceramics, there usually is no turning back. You really only find out that a technique doesn’t work when you open the kiln door. Pots drying in the warm studio, almost ready for the kiln! Lately my attention has been focused on glaze testing and glaze formulation. My methodology is pretty simple in that I only have a few goals in mind. I don’t want to use any toxic materials on my food contact wares and I want a sound glaze fit. I want all of my glazes to match, and sort of “work” with the body of clay that I use. Often times if a clay and glaze don’t match up the glaze won’t fire appropriately. There will be defects in the glaze with the main one that I’m trying to avoid called “crazing”. Crazing is a network of hairline cracks that result from a glaze being under too much tension. You may have seen this on some coffee mugs at some point…a lot of little cracks that start to take on a brown coffee stain look. Unless used as a decoration, crazing shouldn’t happen. I don’t like it. Ceramic test tiles fresh out of a glaze firing. It doesn’t matter if you spend 5 minutes or 5 weeks on a pot. Only once the piece escapes the final glaze firing do you truly see if your work bears any fruit. Every time I open the glaze kiln, I pause a bit…a sort of breath hold. Rushing and impatience when making and creating usually don’t blend well. Lately I’ve felt either pushed to make a quantity of goods or the desire to want to fill orders early…either way you aren’t giving yourself the time to create. Ceramics has taught me to be persistent and flexible. To allow the medium to come to me. To not chase results but let the results surprise you because you never know what you’re going to get. I am learning to be meticulous in note taking. Trying to understand the tiny nuances that have a huge impact on final piece. If things break, get over it…you get to try again. Nowadays while juggling time with my growing family and my growing business it has been hard to allow myself to slow down and focus on what truly matters to me. I’ve been trying to digest whether or not I should trim foot rings on mugs to be able to shave 5 minutes off of my process. 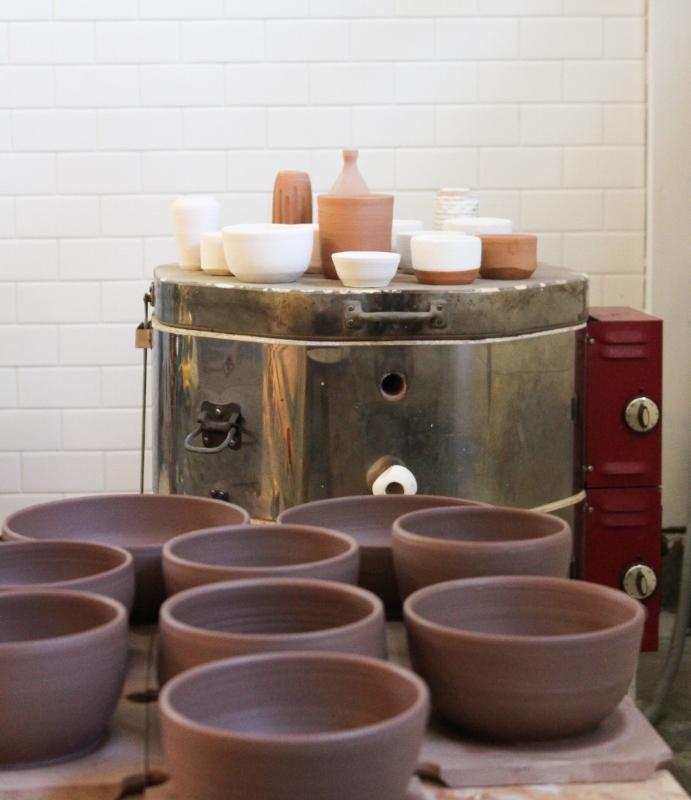 Maybe I shouldn’t sand my bisqueware because it will allow me to fire a glaze kiln sooner? I am forced to remember that the reason I make things is not just to make things. The reason I craft is because I want to be able to make the highest quality handmade goods I can make. My goal is to create pieces that people will love for years. Soon I will be breaking down my process in glaze making and testing. I wish everyone the best.